I fell in love with Montmartre the first time I visited. This village on the hill still maintains its old-world charm in the middle of one of the most cosmopolitan cities. 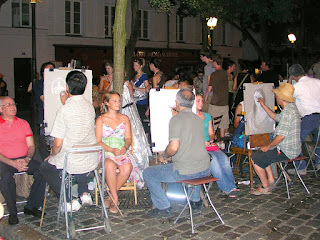 The Place du Tertre – or artists’ square – is my favorite. I enjoy sitting outdoors at one of the many cafes, viewing the sights and sounds of the bustling crowds. And I particularly enjoy wandering around the area, watching the artists paint portraits or caricatures of passing visitors. The square employs 300 artists, but only accommodates 150 at a time, so they alternate work days, setting up their easels from mid-morning until late evening. Artists must submit a portfolio every year to earn one of the coveted spots. The annual payment of 500 euros seems quite reasonable given the popularity of this location. While some may consider this area a tourist trap, I find it charming and reminiscent of a different time and place. I imagine Renoir carrying his canvas, paints, and easel through the square towards the local restaurant on the Rue Lepic. 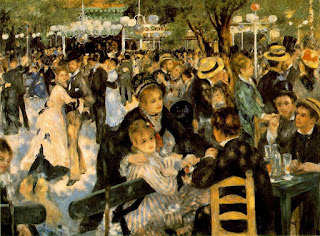 He is in the midst of painting his masterpiece, Le Moulin de la Galette. Or I envision Degas walking to his studio apartment with his sketchbook tucked under his arm after an afternoon with the ballerinas at the Garnier opera house. While Paris is home to some of the greatest museums in the world – the Louvre (classics), the d’Orsay (Impressionists) and the Pompidou (modern), there is still a vibrant art scene on the streets of the city. 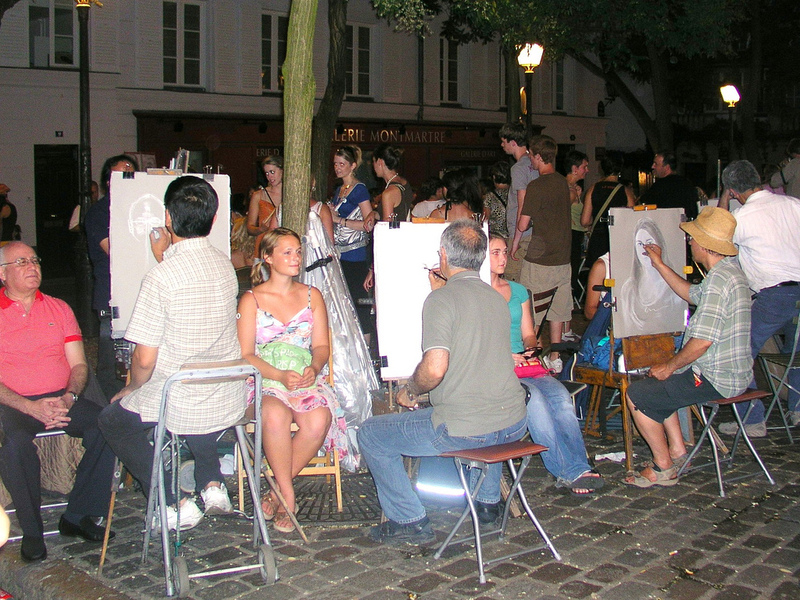 Many reside in the Montmartre region, but you can still find the quintessential painter set up along the Seine, capturing such iconic sights as the Tuileries Gardens, Notre Dame, or the Eiffel Tower. C’est magnifique! This post is part of the 2016 Blogging A-Z Challenge – where nearly 1,700 participants pledge to blog daily throughout the month of April (with the exception of Sundays), with each daily topic corresponding with a different letter of the alphabet. This is a fun social event in the cyber community – and my first time to participate. That's so fascinating that artists have to submit a portfolio to get one of the spots! It would be so interesting to see them at work. Oh good – it is my hope to help readers truly see the Paris I remember. What a beautiful painting your words created! I haven't been to Paris but love reading about it. Someday…. Best of luck and I wish you fun with the challenge. Visited Montmartre MANY years ago as a preteen. I was probably too young to appreciate it fully. Your A-Day post makes me want to return for a follow-up trip. Thanks for stopping by at Fad to the Bone. It doesn't look so different, Renoire's picture and your photography, does it? A wonderful start to the A to Z challenge! I can't draw a stick figure, but I am enamored of those who have artistic talent. WOW, Linda Ann… you are VERY busy this month! Thanks for stopping by, Clao! I hope you get to take that Paris trip soon! I would love to see the artists working! Actually I would just love to go to Paris at all! 🙂 Looking forward to your posts. I loved visiting Paris and surrounding areas. Now I can enjoy revisiting and "see" what I missed during the whirlwind trip. #AlohaFriday to you. Thanks for visiting my site today. I have never visited Hawaii… but it is on the bucket list! 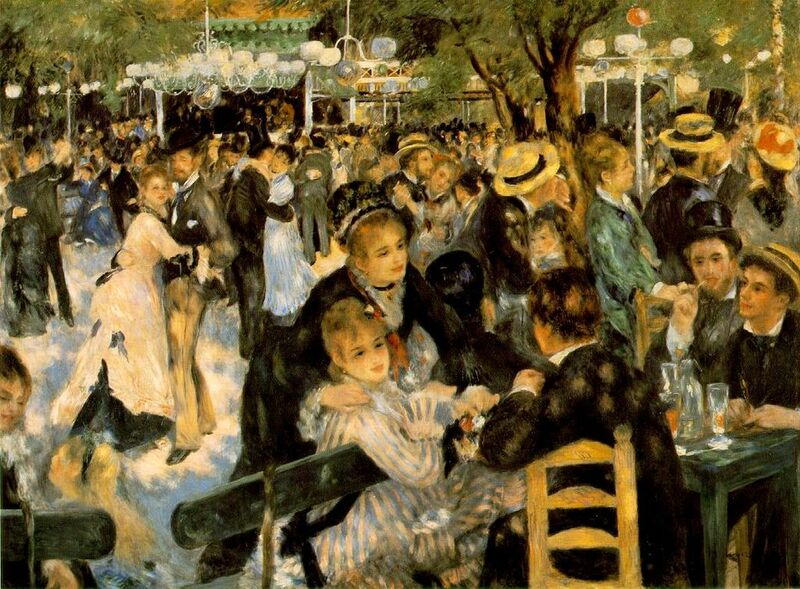 You brought back memories of visiting Montmartre, and mentioned two of my favourite artists – Renoir and Degas. I too never knew that artists had to present a portfolio to be able to display their works there. I bought a delightful little painting to join the collection I have gathered when abroad – my wall of holiday memories! I had the same experience, Leanne! I was on a group tour and we wandered the narrow winding streets from Sacre Coeur until we stepped into the square. A sight to behold, n'est pas?